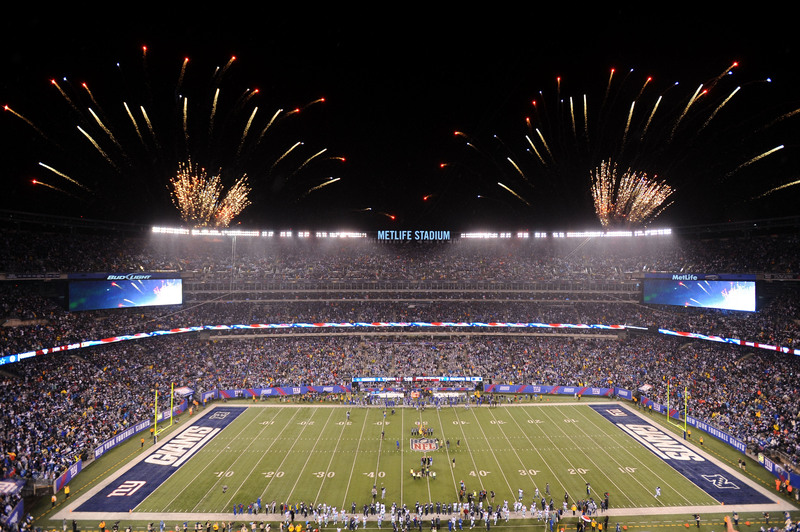 We’re at that time where we need to get the NFL regular season underway. The draft picks are in and we’ve seen how coaches want to implement them. We’ve watched Chip Kelly introduce his offense in Philadelphia and the new 4-3 in Dallas. So how will those teams fare when the ball is kicked off in a few hours? 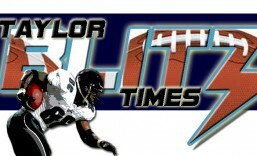 The lingering issue for Taylor Blitz Times is how will RGIII hold up once the hitting starts?? You can only protect him for so long and Coach Shanahan did the right thing keeping him out of meaningless action. The Redskins will benefit having Orakpo back but will have deficient play from their secondary. 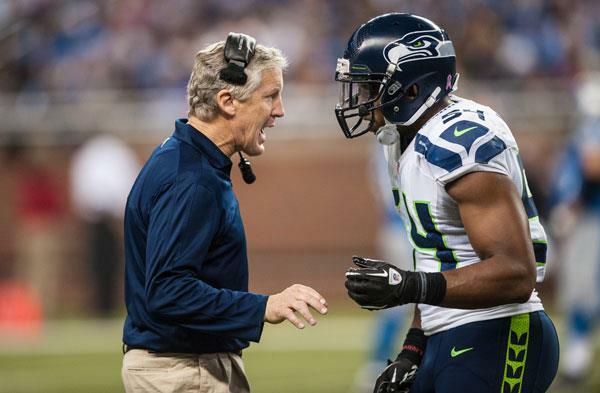 Coach Pete Carroll has the NFL’s best young defense. There had to be some serious angst going through the minds of Seattle Seahawk players, coaches, and fans when the 49ers came back and won the NFC Championship. 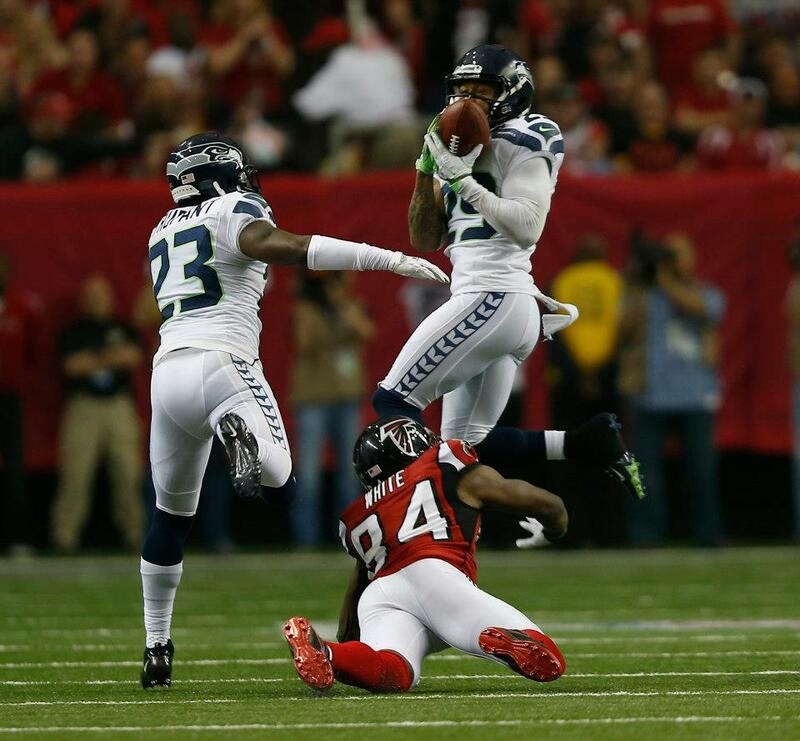 Just a week prior the Seahawks were :31 seconds away from the biggest road playoff comeback in NFL history. Being down 20-0 in Atlanta, the Seahawks made a furious rally that saw them take a 28-27 lead and a rematch with the San Francisco 49ers was beginning to crystalize. A team they had throttled 42-13 just three weeks prior. Then Matt Ryan ended those hopes with two completions and a last second field goal for Atlanta to escape 30-28. As the two teams left the field that day there was a sense the better team hadn’t won. Then to watch history repeat itself with the Niners comeback and you could feel the groans coming from the pacific northwest. Furthermore, how different would the NFC divisional against Atlanta have been had sack leader Chris Clemons (11 1/2 sacks) not been injured?? Quarterback: For all the talk of Andrew Luck, Robert Griffin III, and even Colin Kaepernick, it was Russell Wilson that was the most impressive first year signal caller in 2012. It was his play that set in motion the late season quarterback change in San Francisco. They were tiptoeing around the issue playing Kaepernick in spots until they saw Wilson’s progressive improvement at the season’s midway point. Then the Niners pulled the trigger. Russell’s performance last year was the best rookie quarterback season in NFL history. Not only did he help turn around the fortunes of the Seahawks, he tied Peyton Manning’s rookie record of 26 TD passes. However he only threw 10 interceptions compared to Peyton’s 28 during that same 1998 campaign. His total stats were 252 of 293 for 3,118 yards along with 94 car. for 489 yards and 4 touchdowns. He never showed any nerves nor did the games ever seem too big for him. Where the Seahawks started 1-5 on the road, Wilson’s play improved and they won their last 3 including a wild card win in Washington. The key to his use of The Pistol was he improved his throwing touch and ball placement as the year went on. He knew when to throw the ball away as much as when to run when the ‘read option’ was called. Unlike a few of the other quarterbacks in the same offense, The Chancellor of Football doesn’t see a sophomore slump. The number one reason is he had to endure the baptism by fire at the beginning of last season. Where others like Luck and RGIII seem to hit a wall, Wilson kept improving and was within :31 seconds of the NFC Championship. Head Coach Pete Carroll has to get him in camp and get working on his second season and keep him from having his head in the clouds. 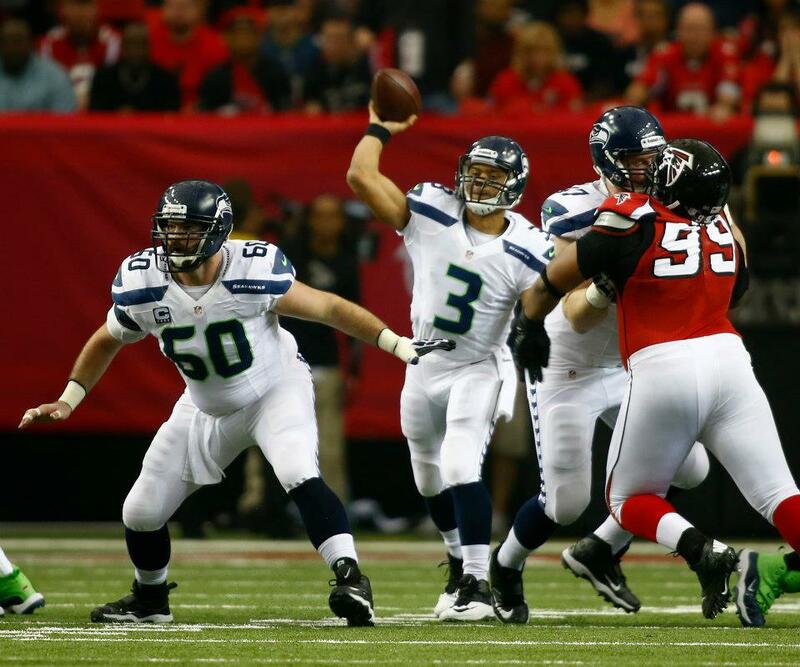 At quarterback the Seahawks are Super Bowl quality. 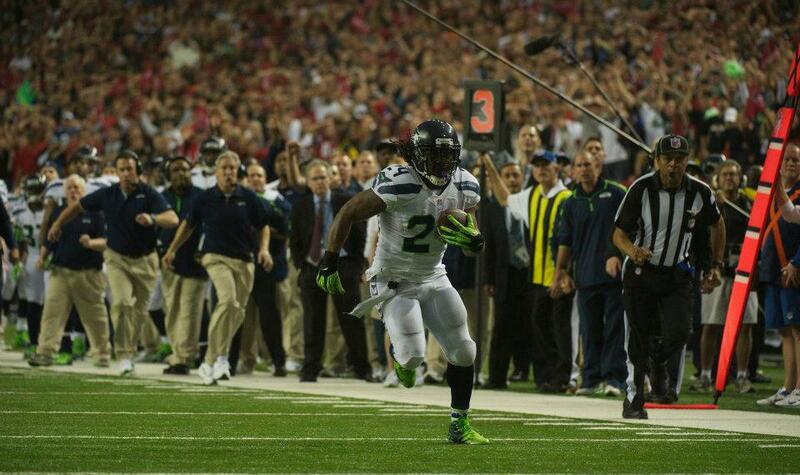 Marshawn Lynch closed in on the goal line during the playoff loss to Atlanta. Backfield: Is there a tougher running back in the NFL than Marshawn Lynch?? Along with Adrian Peterson of the Vikings, no running back clearly defines his team and inspires it through his play. He powered for a career best 1,590 yards rushing and 11 touchdowns as he benefited from the Pistol and the read option in 2012. Last year Lynch was able to get a step on linebackers who were hesitant to attack the line of scrimmage trying to defend against Wilson pulling the ball out and running himself. He was able to be full speed at the point of attack in many of his runs. It’s no coincidence he had a career best 5.0 yards per carry average which was up from 4.2 just a season before. Both years he was a Pro Bowl player. Entering his 7th season, “Beast-mode” may have his career prolonged with this offense allowing less wear and tear on him. He’s only turning 27 this year so there is at least a three year run with him as the featured back barring injury. This team is Super Bowl quality as long as Lynch is running the football. Receivers: This could be where the Seahawks address a need in this year’s draft. Sidney Rice (50 rec. 748 yards 7 TDs) needs a new running mate. Golden Tate (45 rec. 688 yards 7TDs) benefits more from Wilson’s mobility to get open than Rice does. With the right compliment, Rice could return to being a 1,200 yard receiver as teams try to jam the intermediate area (15 yards and under) playing the ‘read option’, it’s fakes and a bigger better receiver that can get open underneath. Because of his physical nature, Tate is better in the slot where he can block and doesn’t shy away from contact. Ask Cowboy linebacker Sean Lee after last year’s encounter. When the team is lined up in more traditional sets, Wilson has Tight Ends Zach Miller (38 rec. 396 yards 3TDs) and Anthony McCoy (18 rec. 291 yards 3TDs) to keep the chains moving. Tactically they are good enough as a unit to win with but could use an upgrade at the ‘Z” receiver and that would free Rice to attack the deep safeties. If they don’t make a move here they will stay below average. 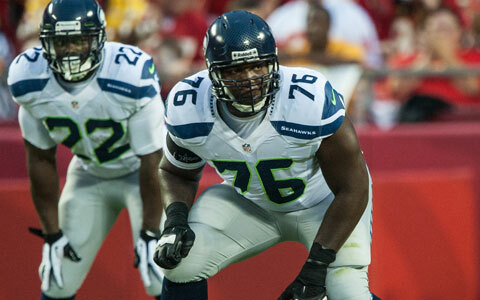 LT Russell Okung is one of the best tackles in the NFL. Offensive Line: This was one of the quiet strengths of the team last year and should be a staple in 2013. John Madden gave his award to the San Francisco 49ers offensive line but this group had a better season. Not only did they give up fewer sacks (33-41) but they paved the way to 2,579 yards (3rd best in the NFL) and 17 touchdowns. Center Max Unger and Left Tackle Russell Okung both made the Pro Bowl and are going into their 4th and 3rd years respectively. In two games against the 49ers they only game up 1 sack against Aldon Smith in both games combined. Without any weaknesses, this group looks to be intact for the next three years and is Super Bowl quality. Defensive Line: The end of the line for the Seahawks came when it was announced that sack leader Chris Clemons was going to miss the NFC Divisional round against Atlanta. They couldn’t mount a pass rush and Matt Ryan was never sacked in the game. This is where the Seahawks could go after another pass rusher whether they bring in a free agent or draft a few players. Clemons had 40 tackles to go along with 11 1/2 sacks and needs some help from LE Red Bryant never got to the quarterback all year. That has to change if they’re to get where they want to go. Designated pass rusher Bruce Irvin did amass 8 sacks but you have to be able to rush the passer on every down since it’s more of a passing league now. Defensive Tackles Brandon Mebane and Alan Branch were stout against the run with 56 and 30 tackles respectively. They ranked 10th against the run and had 20 1/2 sacks but could use more quarterback pressures and are playoff caliber up front. Bruce Irvin tallied 8 sacks in spot duty rushing the passer. 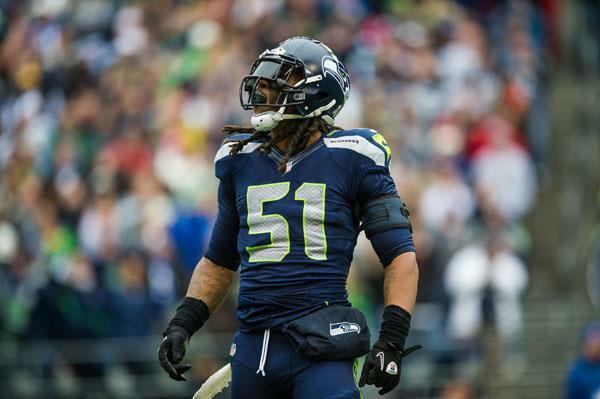 Linebacker: The speed of the Seahawks was most evident at linebacker. Bobby Wagner led the team with 139 tackles and also had two sacks and three interceptions. He had an even better season than divisional rival Patrick Willis at MLB. Whom he might replace in next year’s Pro Bowl with another season like he had. Outside linebacker K.J. Wright started 15 games and garnered 96 tackles and 1 sack. Thes two play a relatively fast game. Trained by Coach Ken Norton Jr, these two fly to the football smothering running backs and tight ends in the under and immediate areas. They don’t miss tackles and at 23 and 24 years old respectively, we should see even more improvement this year. Leroy Hill rounds out this unit and is the greybeard at 30. Will he maintain his starting role in 2013 is a question as this young team develops. This is a Super Bowl caliber group. Earl Thomas patrols the deep middle for Seattle. Secondary: Twitter feud and arguing with Skip Bayless on ESPN’s First Take withstanding, Richard Sherman is one of the best cornerbacks in the NFL. Last year he made the Pro Bowl with 8 interceptions, 63 tackles, a quarterback sack, and 3 forced fumbles. That’s a tremendous year for a player going into his 3rd season. You play like that, you can talk like that. 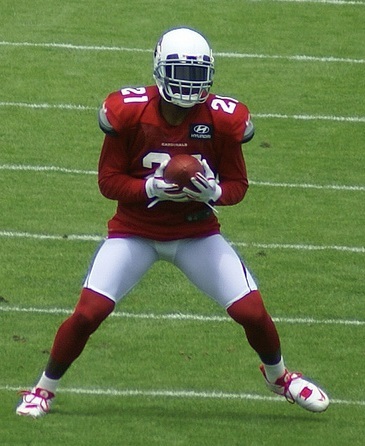 FS Earl Thomas joined him in Hawai’i after a 61 tackle, 3 interception performance. However a couple of dropped interceptions kept SS Kam Chancellor from joining them. He had 91 tackles and several thunderous shots as the enforcer of the best secondary in football. These three are 24, 25, and 25 years of age and play a fast physical game. Brandon Browner is at the other corner and stands 6’4. He along with 6’3 Richard Sherman are the first issues that teams face. They can’t throw over them. They also manhandle smaller receivers when they jam them on the line of scrimmage. Don’t forget Head Coach Pete Carroll’s expertise is coaching in the secondary. Right now he has the best in football and is definitely Super Bowl quality. Overall: If you thought you read the phrase Super Bowl a bunch while you were reading this, you weren’t mistaken. This team was undefeated at home in 2012 and then learned to win on the road as Russell Wilson matured. Their margin of victory at home got wider and wider as the season progressed. In their last two home games they beat the Cardinals 58-0 and the NFC Champion 49ers 42-13. They are aggressive, young and fast. They were the first team to score 150 points in a 3 game stretch in the last 60 years in the NFL. Even in defeat down in Atlanta, Russell Wilson concluded his rookie of the year campaign with 445 combined yards and almost pulled off a great comeback. If you think this team isn’t on a Super Bowl course for 2013, you haven’t watched the NFL that long. They have no obvious weaknesses. The Chancellor of Football sees the NFC side of the ledger going to this group from the pacific northwest. 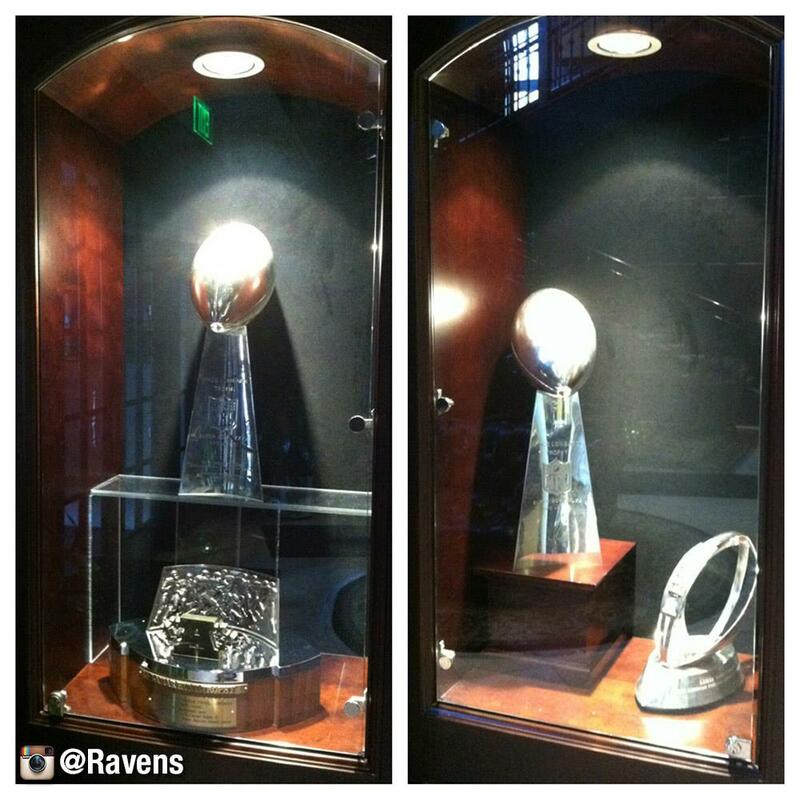 Baltimore’s trophy case holding the Super Bowl XXXV & XLVII Trophies along with the AFC Championship units. When you hold up the trophy at the end of the season, everyone comes gunning for you the following season. However in Baltimore’s case they’re unsure as to who they’re going to be. As the confetti fell, the ink was drying on the retirement papers for Ray Lewis. Friday morning the inked signature of C Matt Birk was scrolled across retirement paperwork as well. Super Bowl XLVII hero Anquan Boldin has said he would retire from the NFL if the Ravens released him. He will not play for another team. Yet a contract restructure should keep his services in Baltimore. All of this before we find out the fate of S Ed Reed and Linebackers Paul Kruger & Danell Ellerbe with their unrestricted free agent status. Will one of them be franchised if they sign Joe Flacco to a long term deal or will Flacco be franchised and one of them walk away as a free agent?? Not since the 1997 MLB champion Florida Marlins have we seen defending champion with so many roster questions going into the next season. In that situation they were having a fire sale for half their roster, in this one it’s all the team leaders with half already gone and the spiritual / emotional leader in Lewis already out of the complex. These next few weeks leading into free agency will tell the tale. Who will the 2013 Baltimore Ravens be?? Even as late as this weekend at the combine, they are still negotiating Flacco’s contract. Quarterback: Well, well, well… Looks like The Chancellor along with LaMarr Woodley had to eat their words when it came down to assessing Joe Flacco’s projected ability to win the big game. Where last year it looked like his career would be defined by the incompletion to Lee Evans in the AFC Championship, a new Flacco emerged gunning his team to a 28-7 3rd quarter Super Bowl lead. Even when things got tight he drove them to the game clinching field goal while eating up valuable time. He finally came through and out-dueled Peyton Manning and Tom Brady to get to that Super Bowl victory. 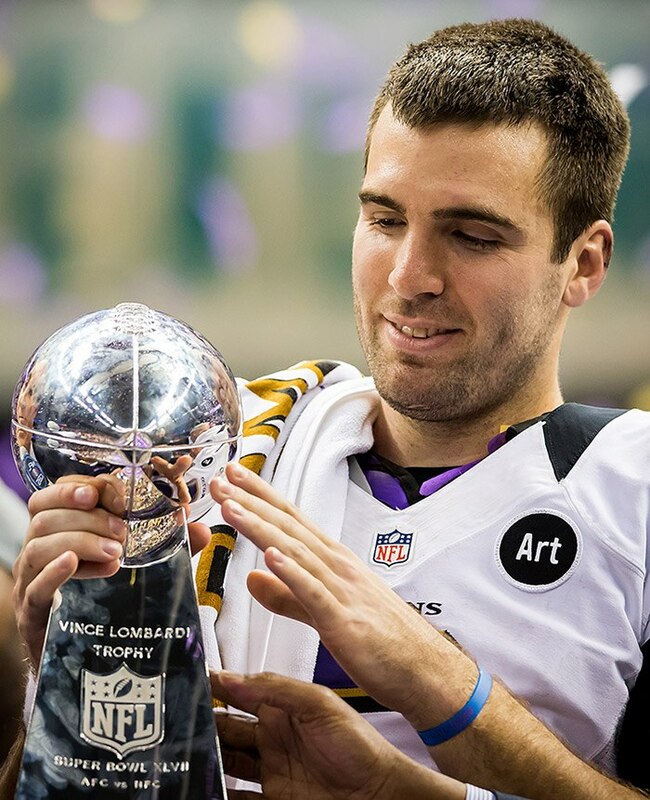 The traces Flacco’s transformation began in that divisional playoff against Denver. Last year our CEO challenged that Flacco wasn’t going through his progressions and just dumping the ball to Ray Rice where there were throws down-field that could have been made. For the season Rice was second on the team with 61 receptions. However in the playoffs, Rice only had 1 reception on a screen against the Colts, none in Denver, 3 in the championship against New England, and 4 in the Super Bowl. Three of those were when the 49ers were coming back and he started to regress a bit. Compare that to Boldin’s postseason, 22 rec. for 380 yards and 4TDs, and you could see how his play improved. He jelled with new play calling coach Jim Caldwell in the playoffs to the tune of 11TDs with zero interceptions in the postseason. Finally, the Ravens are Super Bowl quality at the quarterback position. Offensive Backfield: Now if it hit you during the playoffs that Bernard Pierce was getting almost as many carries as Ray Rice you weren’t seeing things. If you go back to the final two games and go through the playoffs, Pierce had 70 car. for 400 yards to Rice’s 108 car. for 521 yards and 1 touchdown. Pierce was the more physical runner as the season concluded and had an eye popping 5.7 yards per carry. He ran with good body lean and fell forward. Yet with Rice with the big contract he’ll get the majority of the carries in the upcoming season. Bernard Pierce ran hard toward the end of the season averaging 5.7 yards per carry. With 1,527 touches in his first five years, the Ravens were coming close to burning Ray Rice out. Truth be told it’s good that Pierce has emerged to take a load off for various drives or even games where they can afford to rest him. As they did in the season finale against Cincinnati. For the season he did rush for 1,143 yards and 9TDs on 257 carries. However they can trim his work load thanks to second year back in Pierce. They will rely on their running game a little bit more to offset a defense that won’t be as stout as it had in year’s past. The Ravens are in great shape if either were to go down for a stretch in the upcoming season. Depending on how they strategically need to be used to rest the defense. The Chacellor sees a season where Rice / Pierce should see a 60/40 mix as the runners this season. They may want to re-work his contract but that will be going into 2014. As for now the Ravens are playoff quality at the running back position. Receivers: Here is where the first of the question marks show up for the Baltimore Ravens. Restrictive free agent TE Dennis Pitta (61 rec. / 669 yards / 7TDs) and WR Anquan Boldin (65 rec /921 yards / 4 TDs) have question marks at the present time. Right now it looks like they’ll be able to re-sign Pitta, whom Flacco developed a bond with, but Boldin is another scenario. From his free agent contract after leaving the Cardinals, Boldin is due $7.5 million this year and the consensus is he’ll be released. Boldin has said if that happens he’ll retire from the game. Although he was clutch in the AFC Championship & Super Bowl, he would be going into his 11th season and gets by on will. He is going to have to take a drastic pay cut to remain a Raven which we think he’ll do. We’ll have to wait and see. The difference in this team winning the Super Bowl and watching it was Jacoby Jones. While Torrey Smith has emerged as a bonafide playmaker with 8 touchdowns on 49 receptions, it was Jones who was a game changer. When the team needed a charge in the game against Dallas he broke through with a 106 yard kick return touchdown that was the margin of victory that swung momentum in a 31-29 win. When the Ravens took the field in Denver with a little over a minute to go, it was Jones who got behind the defense for the 70 yard touchdown to force overtime. In the Super Bowl when the question was if the 49ers could come back?? Boom he goes 108 on a kick return to boost the lead to 28-6. He is the missing element that the Houston Texans lost when they let him get away as a free agent. Jones will have a bigger role this season even with the return of Boldin. Look for Offensive Co-ordinator Jim Caldwell to unleash formations with Smith and Jones in bunch formations often in 2013. If they get Boldin back this is a Super Bowl caliber group. Without they are still playoff caliber. 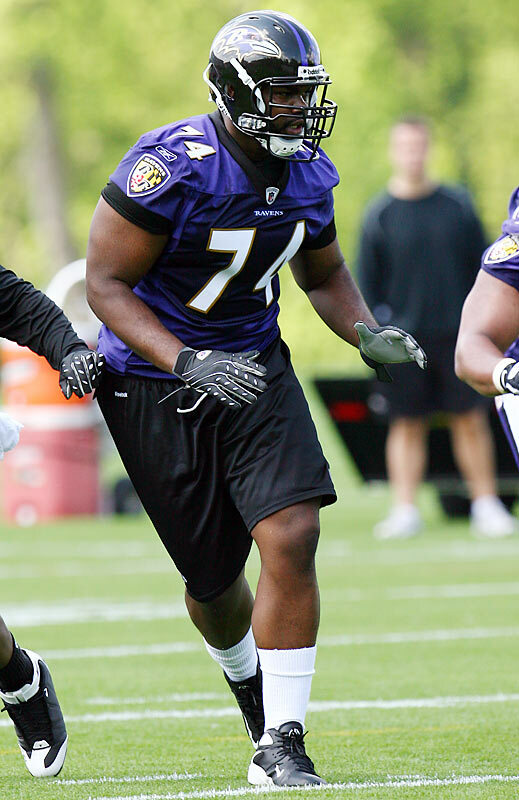 Michael Oher should return to his native LT spot in 2013. Offensive Line: This is where the 2013 questions on the Ravens are the loudest. First of which, how do you replace a team leader and center in the retired Matt Birk?? Are they going to come to terms or even re-sign T Bryant McKinnie?? The Ravens had to shuffle Michael Oher from LT to RT and moved rookie RT Kelechi Osemele to LG and insert McKinnie at LT to replace an injured guard. For the season the team was 20th in sacks allowed with 38. There is no way that Osemele didn’t benefit from learning from Birk as he learned a new position on the fly. It takes more than coaching to do that. This unit paved the way for 444 rushing attempts 1,901 yards and 17 touchdowns. The yardage was good enough for 11th in all of pro football but they could use a little more muscle in the middle. When it came to 3rd or 4th and two or fewer, or even 1st or 2nd down at the goal line, they pushed for a first down or touchdown 58% of the time as compared to 79% on the right. Up the middle is where they can improve on this to keep drives sustained with a younger center. Look for the Ravens to use a couple of draft picks on the offensive line and a pick up or two in free agency at either Center or Tackle. It’s not a given that McKinnie will come back. Until we know what they do once free agency begins we have to give them a below average grade. Replacing a center means to replace the man responsible for blocking audibles. Doubtful they would leave that to a rookie. Defensive Line: For years The Chancellor has said that Haloti Ngata is the best defensive lineman in the NFL. Never was it as evident as in the Super Bowl a month ago. 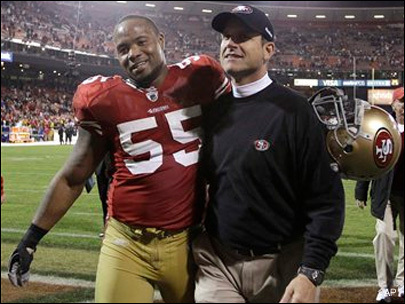 The comeback by the 49ers coincided with his leaving the game with an injury. Up until that point the 49ers were unable to sustain the run on the front side of their read-option. Once he went down you saw the Niners mount their comeback and Frank Gore gained the majority of his 110 yards rushing. In 2012 Ngata made his presence felt again with 50 total tackles and 5 sacks while making his 4th straight Pro Bowl. However you have to worry about the mileage on Ngata’s knees now that he’s turning 30. It’s also time for Terrence “Mount” Cody to start performing like the high draft pick he was out of Alabama. He only started 3 games and had 25 total tackles yet is about to become labeled as a “bust”. Having been beat out by a 33 year old journeyman in Ma’ake Kemoeatu. The Ravens gave up a lot of yards against the run in 2012 and these guys were allowing offensive linemen to get out on linebackers as Baltimore finished 20th against the run. The Ravens need to make a move here in free agency or the draft. Without a great camp it wouldn’t be a surprise to see Cody be released. Lets face it the line in Baltimore is there to stop the run more than rush the passer but they can’t give ground and need to get off blocks. There Cody has struggled. They have to get younger and healthier on the line. If not they will be really beat up toward the end of last season. Right now the Ravens are average on the defensive line. 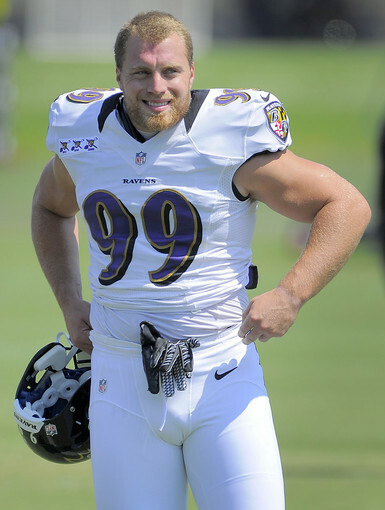 Can the Ravens retain Paul Kruger?? Linebacker: Did you ever think that we’d ever say the Ravens are weakest at the linebacker position?? Well with Paul Kruger, Danell Ellerbe both about to test the free agency market. That leaves Terrell Suggs as the lone cornerstone linebacker on the roster and let’s face it, he was a shell of his former self. He was only getting a quarterback pressure once every 14.5 rushes. That is not enough. Not for a former defensive player of the year. He came in with 8 games to go and only had 2 sacks on the season and 23 tackles on the year. Last year teams were able to block him one on one. The most important re-signs are Kruger and Ellerbe. Kruger had 42 tackles, 6 passes defensed, and 9 sacks. Even in the Super Bowl when San Francisco made it in close to the goal line in the second quarter, Kruger made the sack to force SF to kick a field goal. He made plays from the outside. Ellerbe (89 tackles / 4.5 sacks) on the inside is crucial to maintain some continuity along with Jameel McClain 78 tackles. This is another place where the team may make a move to pick up a free agent linebacker and draft someone for the middle. We see them re-signing Ellerbe and re-signing Kruger is a wish. They do have Shaun Phillips (Chargers), Anthony Spencer (Cowboys), Dwight Freeney (Colts), and possibly Osi Yumeniora (Giants) could be situational pass rushers if they can’t bring back Kruger and they await Suggs to get to full strength. With the questions they have at linebacker we have to say this group is below average if they don’t get Ellerbe back. Overall: Where other prognosticators are saying the Ravens have a legitimate chance to defend their Super Bowl title isn’t looking at projecting out to next year. This team is going to miss the leadership of Ray Lewis, Ed Reed, and C Matt Birk beyond what can be quantified. This team hasn’t had to motivate itself or get emotionally ready to play for the last 17 years. The coaching staff and the team will search to find those next leaders. This team had lost 4 out of 5 coming down the stretch before Lewis brought the team motivation with his retirement announcement. They do have holes in their defense and in the first year without a strong defense, The Chancellor doesn’t think the offense is ready to pick up the slack. The Ravens will really slip this year and they may be a 7-9 or an 8-8 team. They won’t come close to getting back to the Super Bowl. The NFL season is underway and we are late with our version of what we believe will happen in the AFC this season. Many new faces in new places that have teams excited. Most notably was the debut of Peyton Manning in last night’s opening win over the Pittsburgh Steelers. So the Broncos are going to streak to the Super Bowl…right?? Not so fast. A lot of excitement left the arena in Cleveland as the rookie starting tandem of QB Branden Weeden and RB Trent Richardson completely underwhelmed in a 17-16 loss to the Philadelphia Eagles. Had they provided just an ounce of offense they would have prevailed. With fellow rookie QBs Andrew Luck, Ryan Tannenhill starting in Indianapolis and Miami respectively, they also took their lumps in week 1. Yet these teams knew they were going to have a long season and hope to see some growth as the season progresses. There is something the Texans are missing and we won’t find out til later this season. This isn’t the same team that was on the field for them a few seasons ago. They are solid on defense but may have given up too much in letting LB DeMeco Ryans, DE/LB Mario Williams, and CB Duante Robinson out of town. They’ll be solid from a tactical standpoint but will they have playmakers on defense to turn a close game like they couldn’t against the Ravens in last year’s playoff?? Someone has to emerge.. 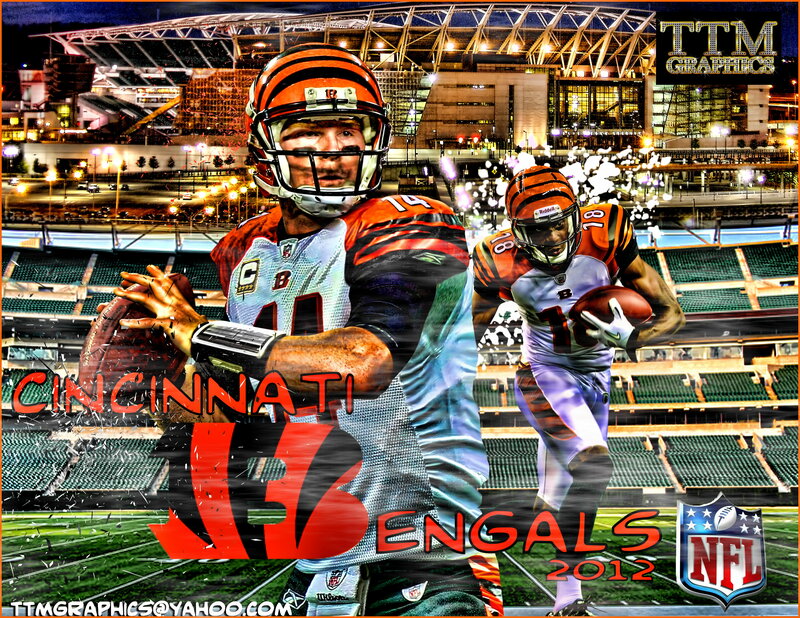 In the AFC North these teams will beat each other up as the best defenses ravage the rest of the conference. The Steelers will emerge because of Ben Roethlisberger winning games with those fast receivers. They will transform into more of an offensive team as their defense ages and eventually will show wear. LB Larry Foote becoming the leader in the middle is well deserved and he played tremendous against Denver early on. They still have the best offensive / defensive personnel in the division and again will narrowly beat out the Ravens in the AFC North. Out west Kansas City will emerge and play as they did in 2010 when they were one of the strongest teams in the league. They lost to the Falcons in week 1 but they are much better than they were in 2011. They are set at every skill position and RB Jamaal Charles looked good coming back from knee surgery. Matt Cassel is looking to have a rebound year and the Chiefs are solid on the offensive and defensive lines. A lot like Tampa in the NFC, this team took a step back although they have a good roster and should bounce back nicely in 2012. As for the Chargers, they are the AFC West version of the Houston Texans. A lot of good football players but lack the playmakers to change games. Add to that WR Vincent Jackson is now down in Tampa and someone new has to emerge. Phillip Rivers is a good quarterback but he can’t go it alone. The Chargers will frustrate their fans as they lose close ball games all year. Until a few playmakers emerge they will watch the playoffs alongside the Oakland Raiders.